A most popular motif from the big square by the Town Hall in Tallinn. 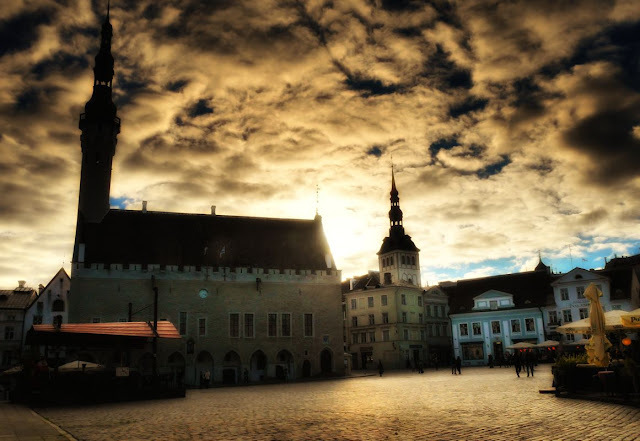 From the net: Town Hall Square / Raekoja Plats The heart of old Tallinn is its medieval town hall square. A market has been held here for centuries and it was the site of at least one execution which apparently arose from a dispute over a bad omelette! There are no executions today of course, but the square continues to play an active role in the lives of local people as well as the many tourists who flock here. The west side of the square is dominated by the town hall which gives it its name (see separate tip). On the other three sides are the typical Tallinn tall narrow buildings, once storehouses for the city's merchants, now bars and restaurants. This is the natural meeting place for locals and tourists alike, and the focus for special events in the city.